= Kono atsusa de kanari kiterune. It means to reach to certain point or degree and it has both negative and positive meaning. We use it often to describe someone such as musician, models, actors who are about to be very popular. You can also use it for things like games, software or music. = He (She) is becoming very popular. = Ima kono kyoku kiterune. = This song is getting to be very popular (now). It related to this idiom. = Chotto atama ni kita mitaine. It could mean someone is either angry or going crazy. =　Maggie sensei ikarechattanja nai? =　Isn’t Maggie-Sensei going crazy? We also use this to malfunctioned machine. = Konpyuutaa ga ikarete shimatta. = My computer went haywire. So we use it for someone who is crazy, spaced-out, kooky, nuts, wacko. We also use it to describe someone who is overly absorbed in something. = Anoko chotto icchatteru ne. = One’s eyes look crazy. 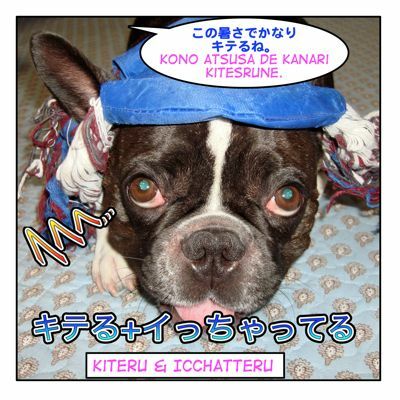 Note : The spelling キテる+イっちゃってる ( = kiteru + icchatteru) could be written きてる、キテル、イッチャッてる ,etc. There is no specific rule but we tend to mix hiragana and katakana to write slang. =Dare? Watashi ga icchatterutte itta no wa? =Who said I was going crazy?! what does kichatteru mean ( if anything)? nakunatta (i get the impression this is for objects being gone). is te – shimau treated a state verb for te iru / te ita i.e. doe dechatte ita mean he has been gone? kiteru can mean “he has come” (te iru state verb for kuru (to come)) or “he going crazy” or “he’s turning popular” depending on the context and kiteru in all three cases is describing “the current state for a verb that describes a change that is more or less instantaneous” – i.e. turning crazy isn’t a near instantaneous transition but is treated as such when using kiteru, so kiteru describes the current state when thinking in japanese. It’s been a while since I visited your wonderful site. 1. what is the plain form of “yarareta? 2. what is the meaning of “kanari”? in the first sentence. Also, what is “de” function here? 3. “watashi ga icchatterutte itta no wa” what is “-tte” here? Also, what is the function of “no wa? I don’t understand the combination.. Thanks in advance for your help and your great efforts to help people learn Japanese.